Weddings Please see yourchurchwedding.org for information about Church Weddings. 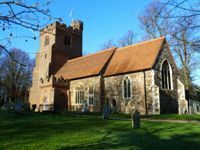 You will see the requirements for you to marry in a particular church and many helpful hints for choosing readings and hymns, how to contact the vicar, the roles of ushers, best man and bridesmaids plus much more. Wedding Flowers and Bells Lesley Worboys co-ordinates flowers in church. Please conatact her on 07922 120181. Please contact Richard Cecil on 07972 696767 if you will want the church bells rung. Baptisms Please see churchofenglandchristenings.org for information about Christenings. You will find help with planning, what Christening/Baptism means, how to choose Godparents and much more. Funerals Please see churchofenglandfunerals.org for step by step information about planning and going to funerals. There are suggested hymns and readings as well as helpful suggestions for all aspects of the funeral service and more. A supervised children&apos;s corner is available in the North Aisle for Sunday 10 am services. Please bring your children along or stay yourselves too. Toys, playdoh, paper and crayons will be available.